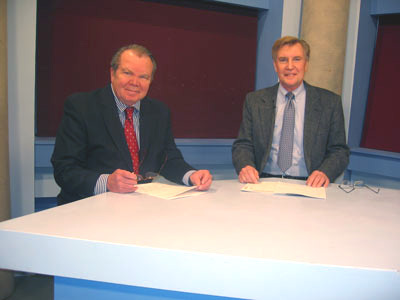 "Out of the Past," the oldest continuous running series on Fairfax County Virginia's public access channel featured almost an entire half hour devoted to the early days of television and specifically WTOP-TV. WTOPTV dot COM's webmaster Lee Shephard (me) and Chuck Langdon hosted the program which also honored Out of the Past's original producer Nick Williams whose death earlier this year left a large hole in Chanel 10's quality program schedule. Chuck and I were asked to host the program since we both were among the original hosts almost 15 years ago. We plan to continue with hosting duties until a permanent replacement can be found. Meanwhile, we are in the process of inviting a few of our WTOP alumni to be our guests on future programs.